The AdderLink AV Series ALAV100P consists of AV-series transmitter (ALAV100T) and receiver (ALAV100R). 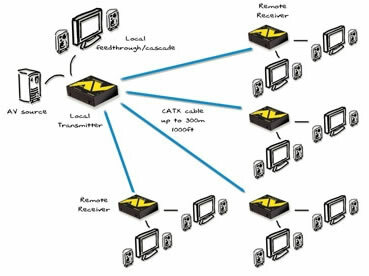 This KVM extender system delivers high video resolutions and quality audio up to 300m/1000 feet using standard CATx cable (x= 5,5e,6,7). Designed for use in Digital Signage applications, the design of this extender allows for flexible distribution that can grow in line with project developments and ensures direct delivery of crystal clear communication to consumers at the point of decision. This product is the replacement for the CatLinc VGA-L.